2014: The Year When The Job Market Finally Turned The Corner Seven years after the Great Recession began, the U.S. job market finally is growing at a robust pace. In November, employers added 321,000 workers, raised wages and extended the average workweek. A construction worker clears wood from a platform that spans the Penn Station railroad tracks in New York City on Nov. 18. 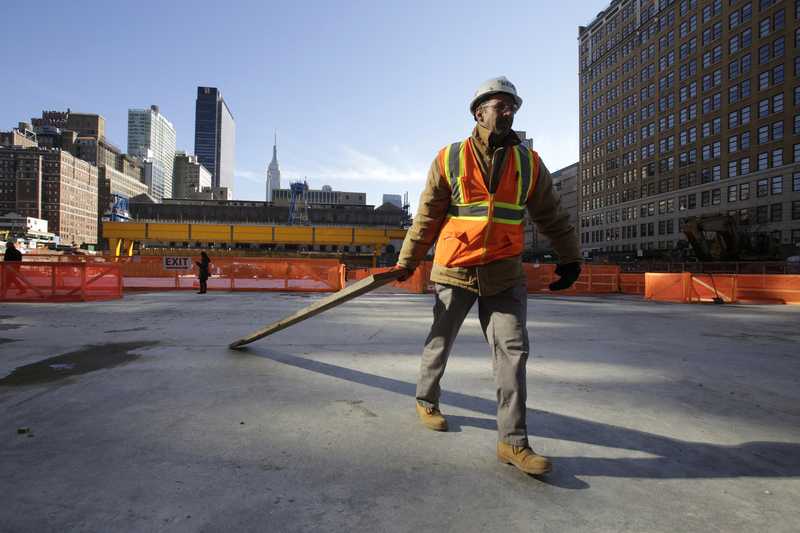 Construction jobs rose by 20,000 according to the November jobs report. As 2014 winds down, you might want to save that calendar hanging next to the fridge. After so many years of misery for the middle class, 2014 is now looking like the one that finally brought relief. The November jobs report, released Friday by the Labor Department, had blowout numbers showing a surge in job creation, an upturn in work hours and a meaningful boost in wages. The job gains were spread across industries, with big improvements for blue-collar workers. Manufacturing jobs jumped by 28,000, and construction jobs rose by 20,000. In all, employers added 321,000 workers. Wages rose by 0.4 percent, or 9 cents an hour to $24.66. That wage bump was twice as high as most economists had been predicting. And the paycheck gains came during a month marked by a dramatic decline in gasoline prices. In other words, last month, workers were getting longer hours and higher pay just as their commuting expenses were declining. Happy holidays! "The American economy is making real progress," President Obama said at a White House event announcing his choice of Ashton Carter as defense secretary. Doug Handler, chief U.S. economist for IHS Global Insight, put it more bluntly in his written assessment: "This was a darn good month for the labor market." GOP House Speaker John Boehner called the November employment report "welcome news" but noted that "millions still remain out of work, and middle-class families across the country, including my home state of Ohio, are struggling to get by on wages that haven't kept pace with rising cost." Indeed, the Great Recession still casts a long shadow. The number of long-term unemployed, that is, people who have been looking for work for more than 27 weeks, was little changed in November, holding at about 2.8 million. And while the overall jobless rate remained steady at 5.8 percent last month, the rate for African-Americans was 11.1 percent. Moreover, wages in retail work, where many minority workers are clustered, were just $14.49 an hour. Dedrick Muhammad, senior director of the NAACP's economic department, spotlighted those figures and said in a statement that "our families need higher wages so that wealth can be built for future generations." Labor Secretary Tom Perez, who spoke with NPR, said that despite ongoing problems with long-term unemployment and relatively slow wage growth, the November report shows the economy now is "moving in the right direction." After the battering they have taken over the seven years since the recession began, many workers may remain wary. One of them is Gabriel Laracuente, 24, who lives in East Harlem and works several jobs. "I still struggle to pay my bills" because wage increases have been scant, he said. And Laracuente would need more evidence of recovery before he could relax. "I feel like a lot of us are going to get dropped the second that the economy goes down again," he said. "I don't feel that confident." Perez said he hopes confidence will rise in 2015 as Americans see that employers "will continue to pick up the pace of growth." The Labor Department revised job numbers for both September and October. Taken together, the two months saw about 44,000 more jobs created than previously reported. 2014 is on track to be the strongest year for job creation since 1999. A year ago, the unemployment rate was 7 percent. The current 5.8 percent is the lowest level since mid-2008. Americans are putting in longer work weeks, up to 34.6 hours, from 34.5 in October. The labor-force participation rate held at 62.8 percent, essentially unchanged since April. NPR intern Robert Szypko contributed to this report.